One of my favourite things to do on a day off is to go to the dollar store to look through what kind of supplies they have for nail art. They usually also have a stash of Essie and NOPI polishes that I can look through, as well as a section of cheaper brand polishes packaged into sets that I've never really given much thought to. 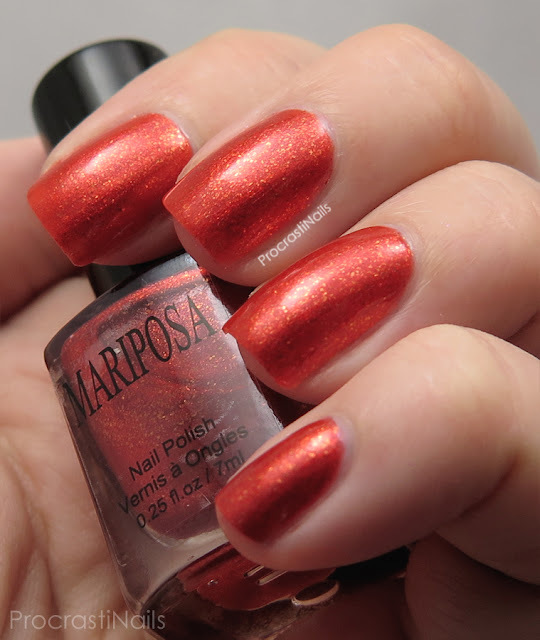 One of those brands is Mariposa and last week I decided "Why not, let's pick some up and give them a try!" Let me tell you, I was pleasantly surprised! 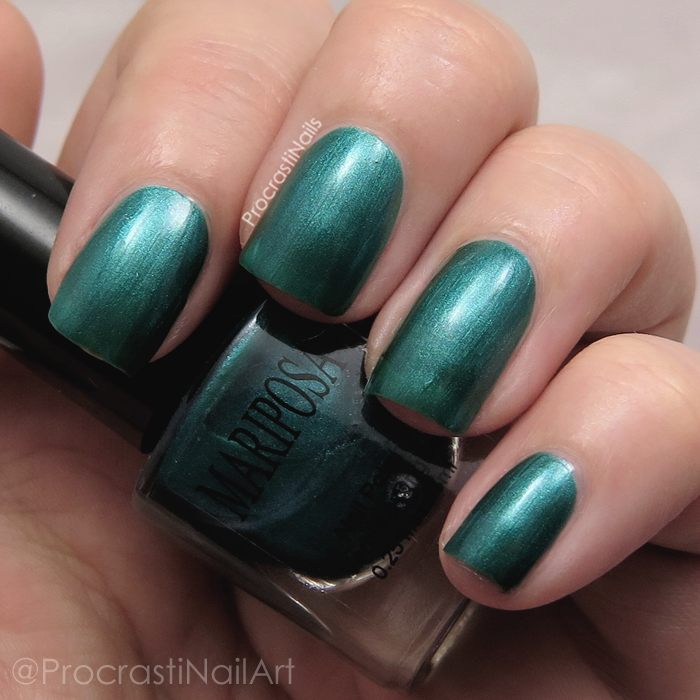 And I can promise - you're gonna wanna look at the macros of these polishes. They are stunning! First off I want to let you know that none of these polishes have names, and that even though I've decided to call this set "Shimmers" not all of them are shimmer polishes. This purple, for example, I would say is more of a frost. 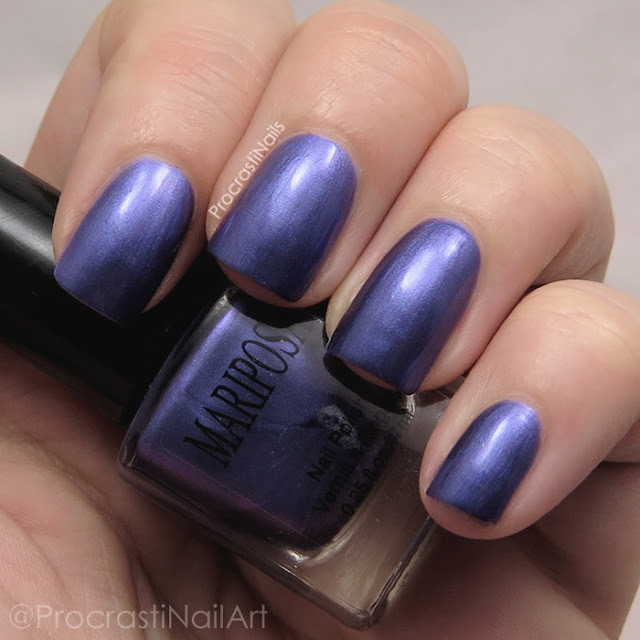 This polish was opaque with two coats, and I'm really in love with the colour. 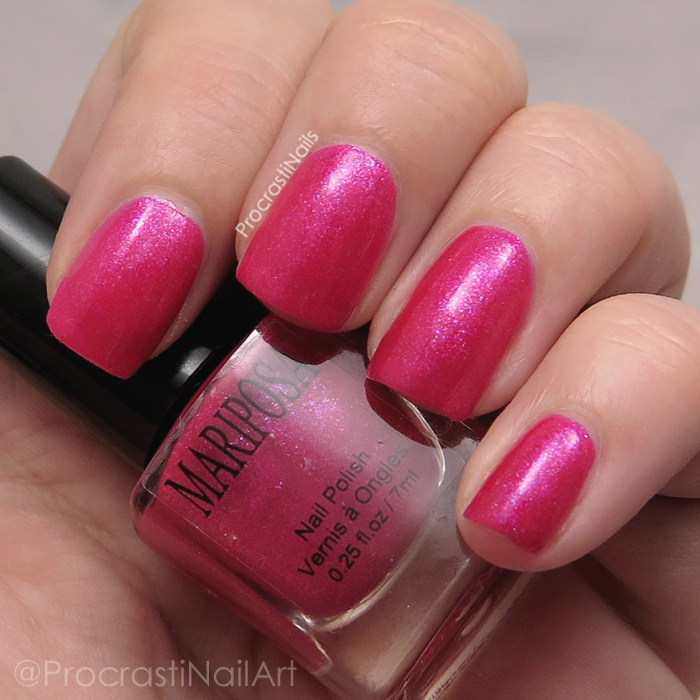 If you look below you can see the pink and blue shimmering particles that are in the polish, which aren't visible to the normal eye but which make the macro shot that much more lovely. This polish dried ridiculously quickly (I would say dry to the touch within 20 seconds) but it's also not 3-free so it does have quite a strong chemical scent when you apply it. Next up we have the green from this set, which I think is a really lovely true shimmer. You have to be a bit careful with brush strokes but the polish reaches full coverage with two coats and dried really quickly. Like the others this one also had a strong smell when the bottle was open. 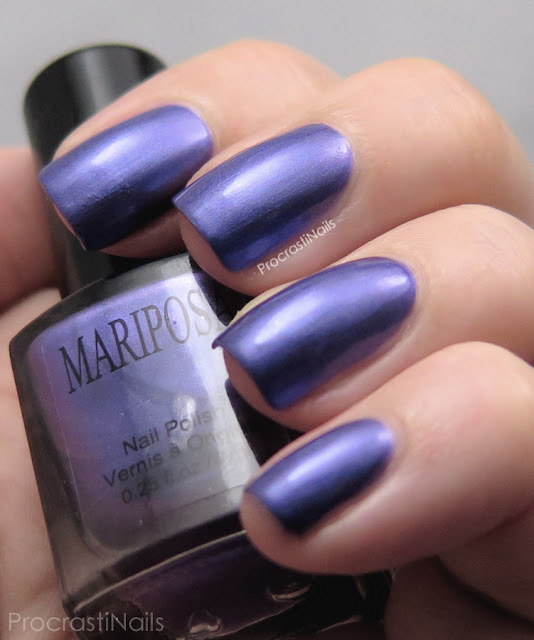 I think a lot of these polishes would be lovely with a matte coat on top, and this is one I really want to try it with. I think the shimmer particles will look lovely, hopefully similar to the Zoya Matte Velvet line. Next up is a bright bubblegum pink which is packed with shimmery flakies! 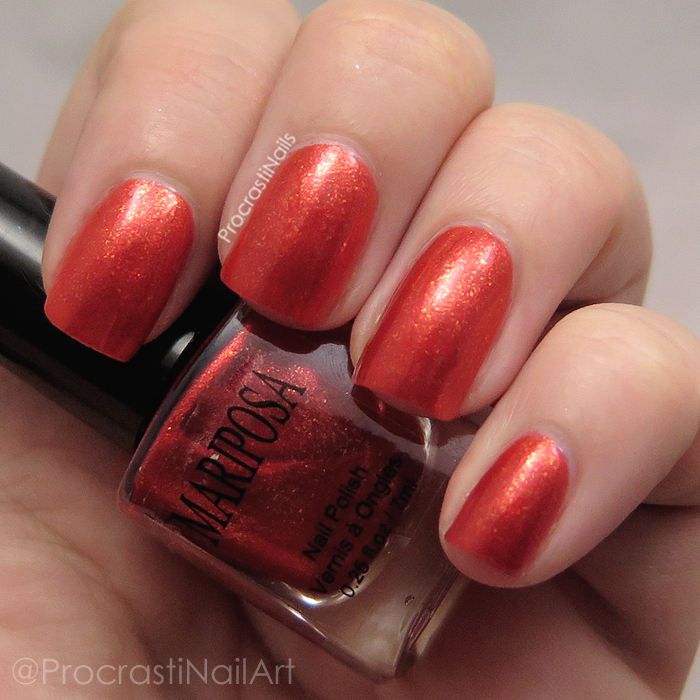 I adore how this one looks in macro view, you can really see the depth the polish has. I did three coats with this one just to make sure I had full coverage but I think you could get away with two. The chemical scent was there with this one, too. 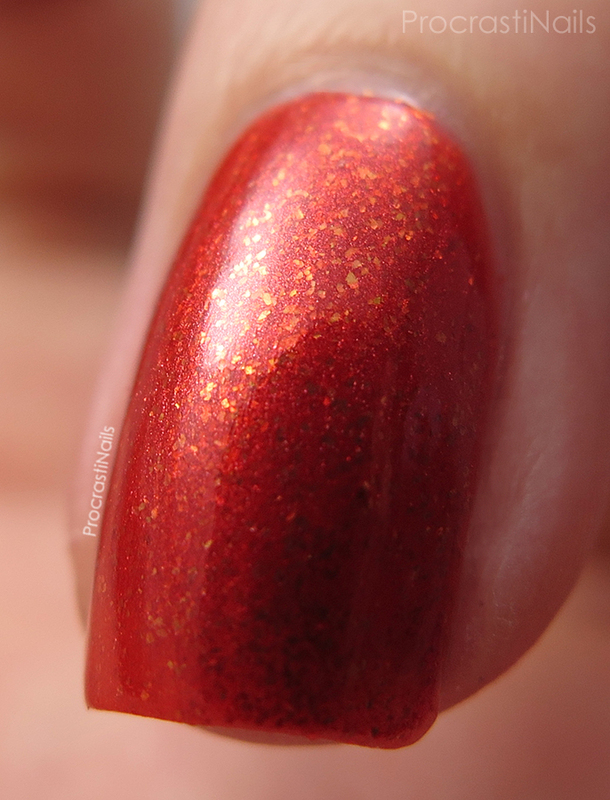 This is one of my favourites from the set - this burnt orange flakies is also stunning under macro (which you can see below) and built up really well with just two coats. 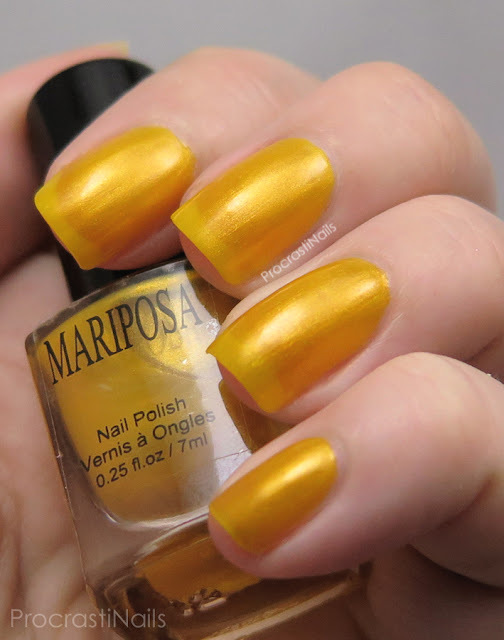 The polish seems to have an orange shimmer base with a healthy dose of gold-leaning orange flakies scattered throughout. And yes, the chemical scent was still here, though I stopped noticing it by this point in the swatching process. The yellow was obviously the most sheer of the set. 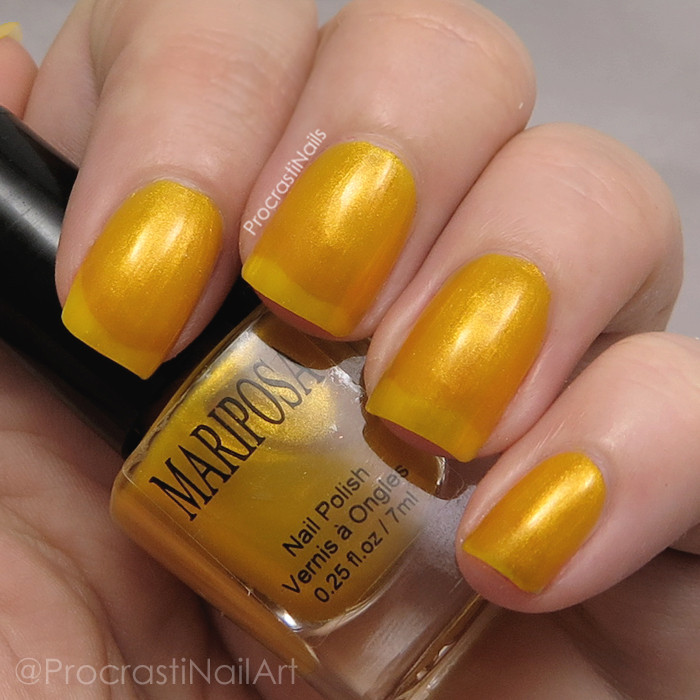 I would describe it as a sheer yellow jelly shimmer, though to be fair I was impressed with how well it built up. This is three coats and if you used white undies you would probably be fine with two. As is you can see there is a lot visible nail line remaining. That chemical scent remained, but again by now I was desensitised to it (is that a good thing? lol). 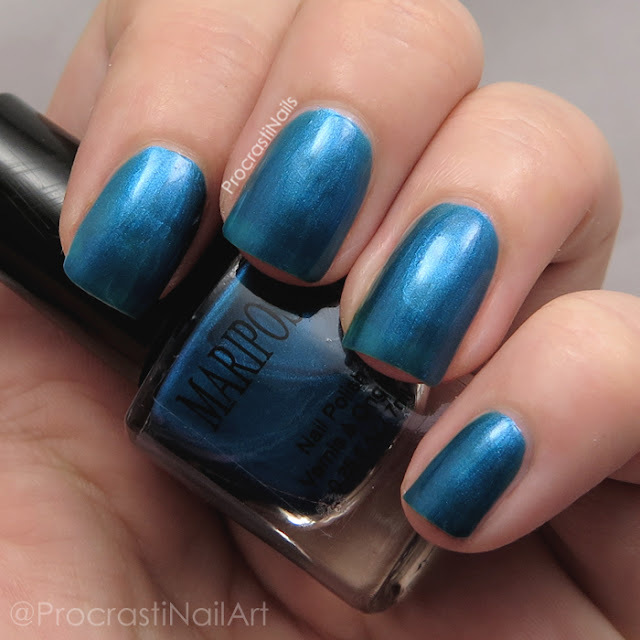 The last polish in this 6-piece set is this bright blue shimmer. It applied well with two coats (though I think there's a wee bit of visible nail line left, so I would do three next time) and like all the others dried really quickly. That scent hung around through the last bottle too, so there's no escaping it with this formula I guess. 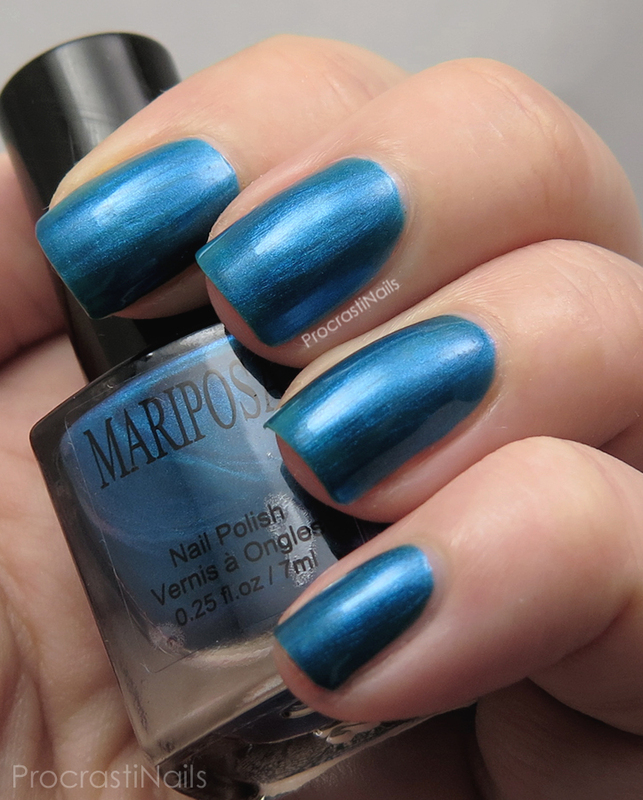 Overall I was amazingly impressed with the quality of these polishes. At $3 for the set they come out to 50c each, and for the price the polish is wonderfully pigmented and applies like a dream. Very little issue with brush strokes and zero issues with pulling or bald patches. The super quick dry time was a bonus. The downsides mainly come down to the fact that the polish isn't 3-free and the strong chemical scent would probably bother a lot of people. I'm going to try using these polishes for water marbling in the future, and I also think they would make a great base for stamping. They're not amazingly unique colours, but I really like them and I hope I use them a few times before they become forgotten to the back of my helmer. I would have to say my favourites are the orange, the pink and (surprisingly enough) the yellow. What about you? :) What do you think about featuring polishes that are on the cheaper end, do you ever pick brands like this up at Dollarama? These are really nice. I really like the green and pink ones. They all are looking pretty nice. Wonderful swatches of each polish too. I go to the Dollar Tree and poke around for polishes too, but lately all my stores have just sucked for selection! Anyway, I really love that purple on you, it's so pretty! These look really great!! I love the orange polish! I'm not usually a fan of these kind of finishes but the colors are really pretty- especially the orange! Pffff 6 for 3$? That's a deal! And flakies in a drugstore brand is such a surprise to see! The scent would probably definitely bother me since I have a sensitive nose. But I have to say these colors might be worth it they are so beautiful. I've never heard of this brand There's no way I could handle the smell, I get migraines easily. I do like the orange though. It's beautiful. Wow, that's a really nice score, 6 beailuties for 3 dollar! I quite like these. I am such a sucker for a good pink. But I can't do strong smelling polish. The purple is my favorite! Very pretty!